In honor of Memorial Day, I am remembering all of our veterans, families, and volunteers who help make our homes and communities safe. I am grateful to live in a quiet town where I can walk down my street and wave at my neighbors and watch the kids play in the park across the street. The summer weather has brought everyone outside, and yards and gardens are full of blooming plants and trees. And that seemed like a good time to have a sale on my Vintage Floral Sampler Block of the Month Blocks. 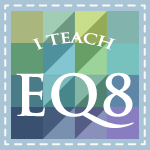 I just posted blocks 10 and 11 so hurry and get those blocks while they are available for free. Miss any of the previous blocks? Want some of the larger 12" crossing blocks or 16" wreath blocks? The sets of all previous blocks are on sale for $4.00 just until June 1!! Rock on over to my website and pick up any missed blocks for nearly 40% off the regular price. Hope you have a wonderful Memorial Day Holiday. Now for a GREAT Incredible give-away offer. Would you like to win a complete pattern and kit for the Market Place Mosaic Quilt? Morning Glory Designs has teamed up with Connect the Blocks.com to offer you a chance to win this incredible package of batik fabrics worth more than $100!! Your can purchase just the pattern HERE. But if you want a chance to win the pattern AND a kit full of all the batik fabrics to make this quilt. . . . . . .
1) Go to the Connect theBlocks Facebook page first and "LIKE" the page. 2) Then scroll down to the first comment, click on the link, fill it in, and hit "send" - that will subscribe you to the Connect the Blocks newsletter and confirm you are new to the list. --OR-- After you have LIKED the page you can go HERE to subscribe to the newsletter. By doing BOTH you will be entered into a drawing for the Marketplace Mosaic pattern plus the kit -- with a combined retail value of $114. All Entries must be completed by May 31 to be eligible for the give-away. Good luck and happy holiday. Its May! Did you ever dance around a maypole? Nope, me neither. But my sister did, in college no less. I think they had to wear white and put flowers in their hair. One of those archaic traditions which probably passed into obscurity along with punting and freshman beanies. However, May at Morning Glory Designs always means flowers in my yard, the end of another academic semester, nice weather in Kansas, and graduations. Plus, more time to sew and quilt! I hope you are enjoying your May as much as I enjoy mine. Block 9 of the Vintage Sampler is ready to go. Check out the BOM page to see the newest free Block of the Month. 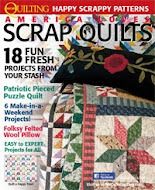 My local quilt shop, Quilting Bits and Pieces in Eudora, KS is offering my Block of the Month, and they are kitting it with adorable 1930's fabrics. Here are their first two blocks. Aren't they cute? I am so tempted to do them again in 30's fabrics! Faith made these wonderful sample blocks and used hand blanket stitched edges in matching embroidery floss. Contact the shop if you want to purchase the matching floss along with the kits. They are offering 2 blocks each month which includes a full color pattern, background fabric and all the flower fabrics. The price includes sashing and borders. I know they are only cutting a limited number of kits so if you want to order these you should contact them right away. They do mail order, and if you pay in advance you get free shipping! Rose and Leaf is block 9 of the Vintage Sampler BOM here. 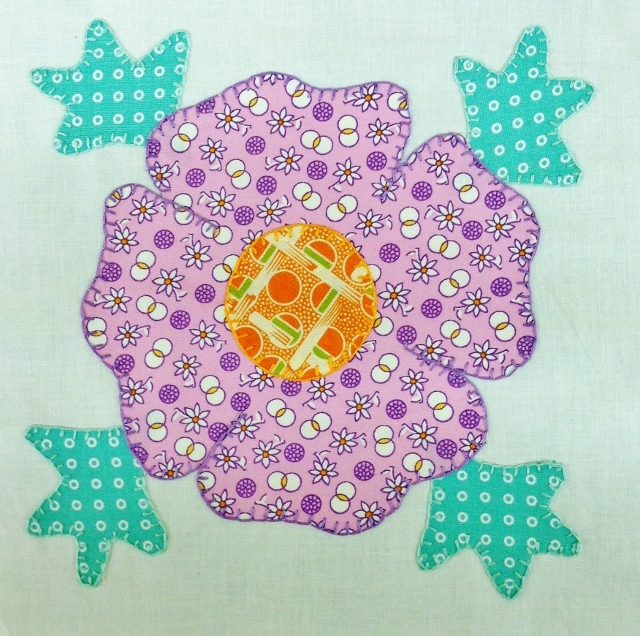 It is a sweet variation of the traditional Rose of Sharon block. And we have a winner!! Last time I asked for suggestions for a name for the new BOM quilt that I am offering. And Lynne came up with a winning suggestion. And let me tell you it was a tough choice and I am glad I did not have to do the choosing. 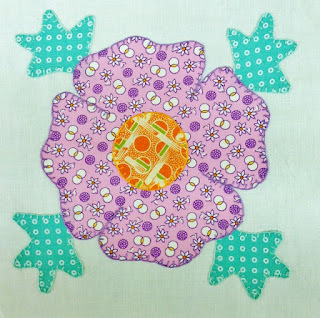 The gals at the quilt shop chimed in with their favorites and they picked a winner. There is still time to sign up for this block of the month kit. 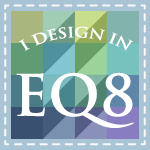 Contact Quilting Bits and Pieces to enroll. Price includes pattern, all fabric for blocks, sashing and borders. Wow, what a busy month. And it is only May 2!